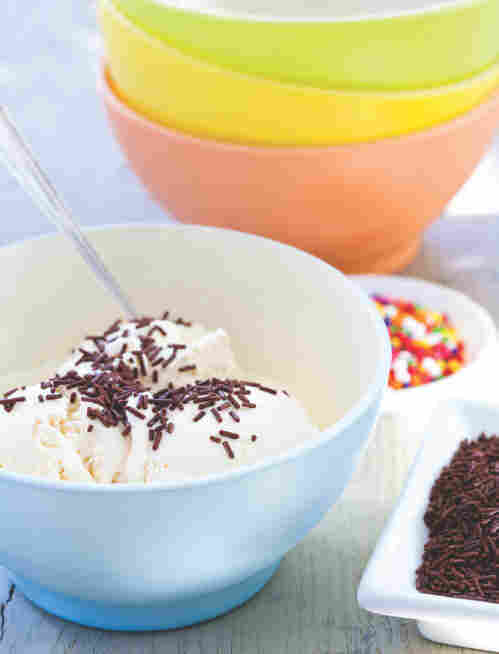 Seasonal Dessert Recipes To Sweeten Your Summer Chris Kimball, host of public television's America's Test Kitchen, shares recipes for his favorite summer desserts and the American culinary traditions that inspired them. It's that time of year again — when the peaches are sweet and the blackberries are ripe on the bush. So how about skipping straight to dessert? Chris Kimball hosts public television's America's Test Kitchen, where he and a team of full-time cooks test recipes to perfection. He says when it comes to summertime desserts, it's important to highlight the best aspects of what's in season. "You take the principle ingredient, usually fruit," he says, "and you let it shine." Kimball joins NPR's Renee Montagne to share some of his favorite summer dessert recipes, many of which draw from America's culinary past. According to Kimball, the Brown Betty first appeared on American tables in the 1840s and '50s. "It was layers of fruit, usually apple. And then they layered buttered, slightly sweetened breadcrumbs in three or four layers," Kimball says. Brown Betty was also the name of a rather unusual drink, made with water, brown sugar, ale, brandy — and two slices of toast. "They put the toast in the liquid," Kimball says, laughing. "Don't ask me why." Kimball's Peach Brown Betty replaces the apples with seasonal summer peaches. "The problem with peaches of course is they're juicy," Kimball says. "So, we ended up doing this very differently. We did it in a skillet. We cooked the peaches down for a few minutes [with] a little bit of butter. And then we mixed in some of the breadcrumbs and then topped it with breadcrumbs and threw it in an oven for about 20 minutes." 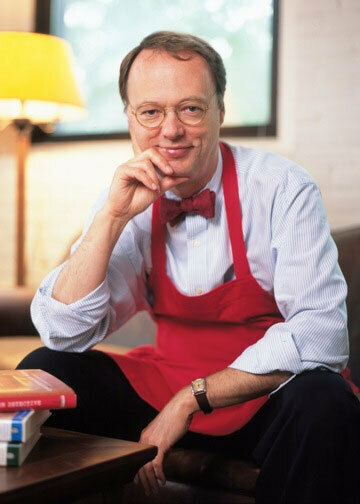 Chris Kimball is the host of public television's America's Test Kitchen, and founder of Cook's Illustrated and Cook's Country. Swapping the fruit is simple to do and — in Kimball's opinion — a welcome improvement to this traditional recipe. Making your own ice cream is a lot of work. You need milk, cream and eggs; there's some beating, some cooking, some cooling and, of course, a big, bulky ice cream machine. But Kimball has a recipe that takes the sweat out of the process. He calls it Magic Vanilla Ice Cream. "This is a dessert that takes three minutes to put together, and there's no ice cream machine," Kimball says. He and his team figured out two tricks for making it; they use sweetened condensed milk, which doesn't crystallize when you freeze it, and they also add white chocolate morsels, which act as thickening agents when the mixture cools. Whipped cream is added to aerate the mix, and a little sour cream adds flavor. "That gets heated in the microwave, just the chips and the milk," Kimball says. "You put everything together, you throw [it] in the freezer — six hours and it comes out." The result is a creamy — and easy — summer treat. According to Kimball, the Roly Poly is a 100-year-old British tradition. 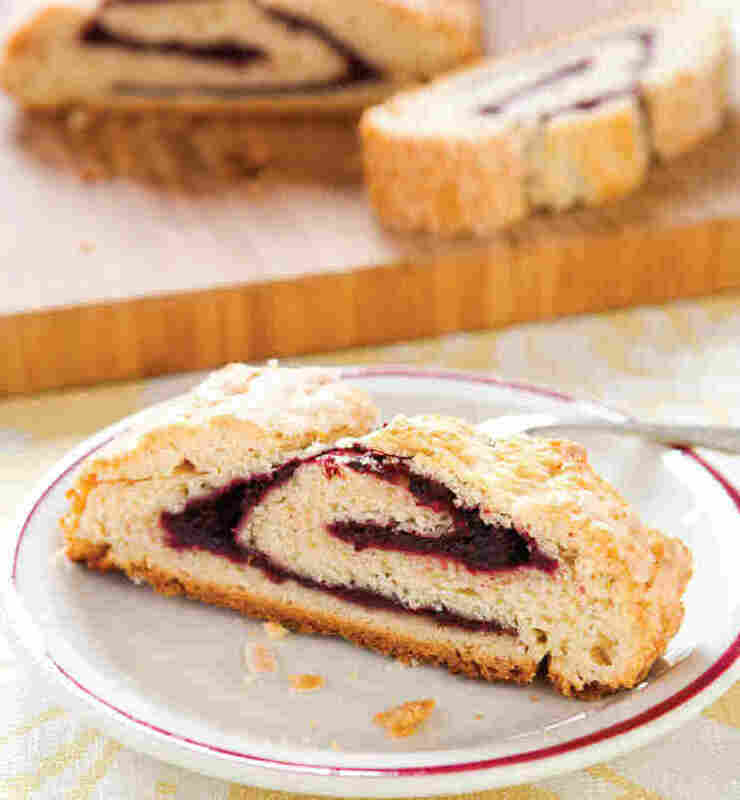 "[The British] would take a pastry — a dough — roll it out thin into a rectangle, put some jam or fruit preserves on it, roll it up, put it in cotton, tie the ends, and they would steam it or boil it," Kimball explains. The finished product was also known by a far less appetizing name: Dead Man's Arm. "Yeah, I know — ew," Kimball says. "And I can assure you, when you take it out ... it looks like a dead man's arm." Kimball and his team departed from traditional steamed puddings for their Blackberry Roly Poly recipe. "We came up with a biscuit," Kimball says. "We added a little bit more fat to it, a little sugar, and we rolled it out." In 10 minutes, they also made their own jam using fresh blackberries and sugar. "We put that on the dough, rolled it up, and we baked it for about 40 minutes. It's fabulous." Kimball's last dessert isn't really a dessert at all. 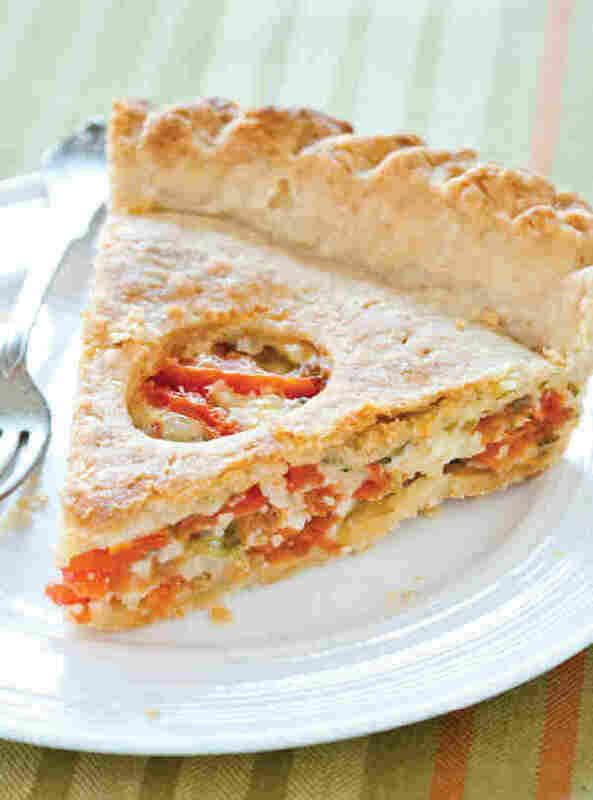 It's a savory Summer Tomato Pie. "Don't forget, pies in the 19th century were ubiquitous," Kimball says. "You put anything in a pie." For this dish, thin layers of mayonnaise and cheese separate layers of beefsteak tomatoes. "It's a little bit like a tomato sandwich, except it's a pie," Kimball says. According to Kimball, it's the perfect dish for any time of the day, even breakfast. "It's very much like an American quiche," Kimball says. "I think [it's] actually a little bit better than quiche — but I'm American." You can substitute 3 pounds of thawed and drained frozen sliced peaches for fresh peaches. 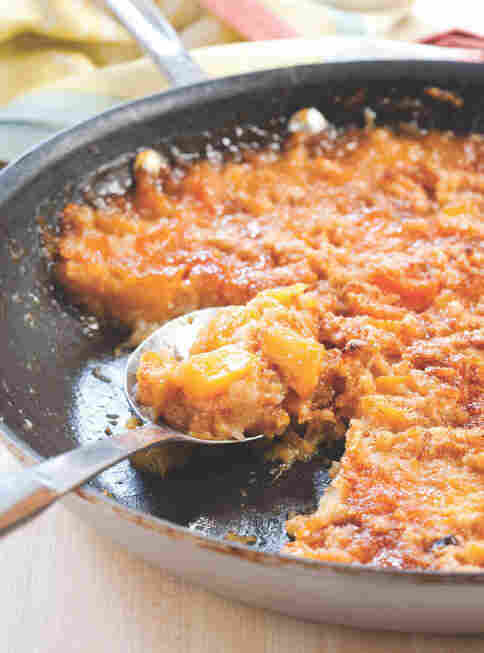 If you don't own an ovensafe skillet, transfer the peach filling to a 2-quart baking dish at the end of step 2 and continue with the recipe as directed. 1. Pulse Topping Adjust oven rack to middle position and heat oven to 400 degrees. Pulse bread and butter in food processor until coarsely ground. Set aside. Combine sugar and cinnamon in small bowl. 2. Cook Peaches Melt butter in large nonstick ovensafe skillet over medium-high heat. Cook peaches, stirring occasionally, until they begin to caramelize, 8 to 12 minutes. Off heat, stir in 1 cup crumb mixture, sugars, lemon juice, vanilla and salt. 3. Top And Bake Top peach mixture with remaining crumbs. Sprinkle with cinnamon sugar and bake until topping is golden brown and juices are bubbling, 20 to 25 minutes. Cool 10 minutes. Serve warm. Shop carefully: White chocolate varies greatly in quality. We like Guittard Choc-O-Lait Chips or Ghirardelli Classic White Chips. If you use a bar instead of chips, chop it fine before melting it in step 1. If you plan to store the ice cream for more than a few days, place plastic wrap directly on its surface before you freeze it. 1. Make Base Microwave sweetened condensed milk and white chocolate in large bowl until chocolate melts, stirring halfway, about 30 seconds. Let cool. Stir in vanilla, salt and sour cream. Both fresh and frozen blackberries will work. Like a biscuit, Roly Poly tastes best on the day it's baked. Use a serrated knife to slice it. 1. Make Jam Cook berries and 1/4 cup sugar in saucepan over medium-low heat until berries begin to release juice, about 3 minutes. Increase heat to medium-high and cook, stirring frequently, until berries break down and mixture is thick and jam-like, about 10 minutes (mixture should measure 1/2 cup). Transfer jam to bowl, stir in zest, and cool to room temperature. 2. Process Dough Pulse flour, baking powder, salt, additional 1/3 cup sugar and all but 1 tablespoon butter in food processor until mixture resembles coarse meal. Transfer to large bowl and stir in milk until combined. 3. Shape Dough Adjust oven rack to middle position and heat oven to 375 degrees. Line baking sheet with parchment paper. Turn dough out onto lightly floured surface and knead until smooth, 8 to 10 times. Pat dough into 6-inch square, wrap with plastic, and freeze until just firm, about 20 minutes. Following photos 1 to 4, roll dough into 12- by 10-inch rectangle, spread with jam, roll into tight cylinder, and arrange seamdown on prepared baking sheet. 4. Bake Melt remaining butter and brush over dough. Sprinkle with remaining sugar and bake until golden brown, about 45 minutes. Let cool 10 minutes on sheet, then transfer to wire rack. Serve warm or at room temperature. Visit CooksCountry.com for our Double-Crust Pie Dough, or use your own recipe or store-bought dough. If using store-bought dough, bake the pie for 30 minutes after turning down the heat in step 4. 1. Roll Dough On lightly floured surface, roll 1 dough round into 12-inch circle (if using store-bought dough, you do not need to roll either crust). Transfer to 9-inch pie plate, letting excess hang over edge. Cover with plastic and refrigerate 30 minutes. Roll second round into 12-inch circle and refrigerate for 30 minutes. 2. Drain Tomatoes Arrange tomatoes on paper towel-lined baking sheet and sprinkle with salt. Let drain 30 minutes, then press tomatoes with additional paper towels until very dry. 3. Assemble Pie Adjust oven rack to lowest position, place empty rimmed baking sheet on rack, and heat oven to 450 degrees. Mix mayonnaise, cornstarch, and 1 cup cheese in bowl until well combined. Sprinkle remaining cheese over bottom of dough-lined pie plate. Arrange third of tomatoes over cheese. Spread half of mayonnaise mixture over tomatoes and sprinkle with half of scallions. Layer with another third of tomatoes, remaining mayonnaise mixture, and remaining scallions, then top with remaining tomatoes. 4. Crimp Crust Arrange top crust on pie. Press crusts together, then trim, fold and crimp edges. Cut four 2-by1-inch oval vent holes in top. Place pie on heated baking sheet, bake for 10 minutes, then lower oven temperature to 325 degrees and bake until crust is golden brown, about 40 minutes. Cool on wire rack at least 3 hours. Serve at room temperature. Stale the bread for this recipe by leaving it out overnight. Otherwise, put the slices on a rack in a single layer into a 200-degree oven for 50 to 60 minutes, turning them once halfway through. For this recipe, you will need six 6-ounce ramekins and a round cookie cutter of slightly smaller diameter than the ramekins. If you don't have the right size cutter, use a paring knife and the bottom of a ramekin (most ramekins taper toward the bottom) as a guide for trimming the rounds. If you use challah, the second choice for bread, cut it into 1/2-inch-thick slices. If neither potato bread nor challah is available, use a good-quality white sandwich bread with a dense, soft texture. Whipped cream is the perfect accompaniment to summer pudding. 1. Heat strawberries, raspberries, blueberries, blackberries and sugar in large nonreactive saucepan over medium heat, stirring occasionally, until berries begin to release their juice and sugar has dissolved, about 5 minutes. Off heat, stir in lemon juice; let cool to room temperature. 2. While berries are cooling, cut out 12 bread rounds, following illustration 1 (above). 3. Spray six 6-ounce ramekins with vegetable cooking spray and place on rimmed cookie sheet. 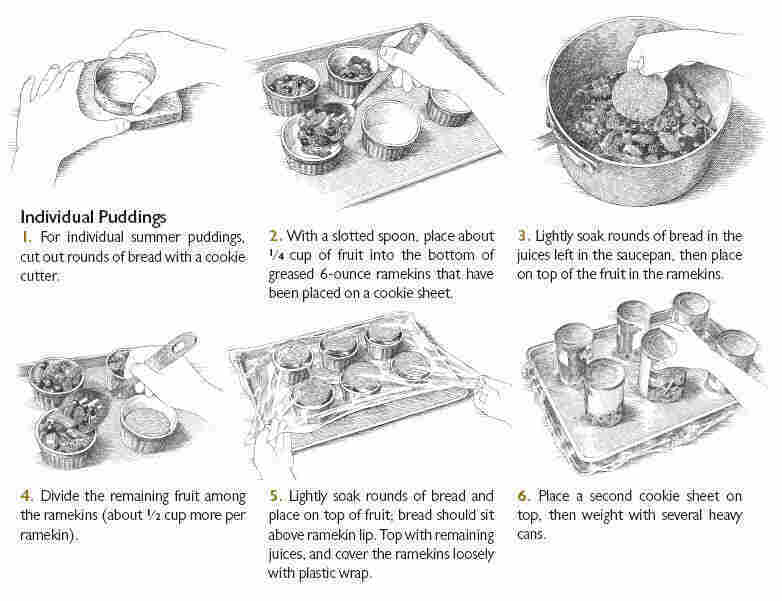 Following illustrations 2 to 6, assemble, cover and weight summer puddings. Refrigerate puddings for at least 8 and up to 24 hours. 4. Remove weights, cookie sheet and plastic wrap. Run a paring knife around ramekin perimeters, unmold and serve. 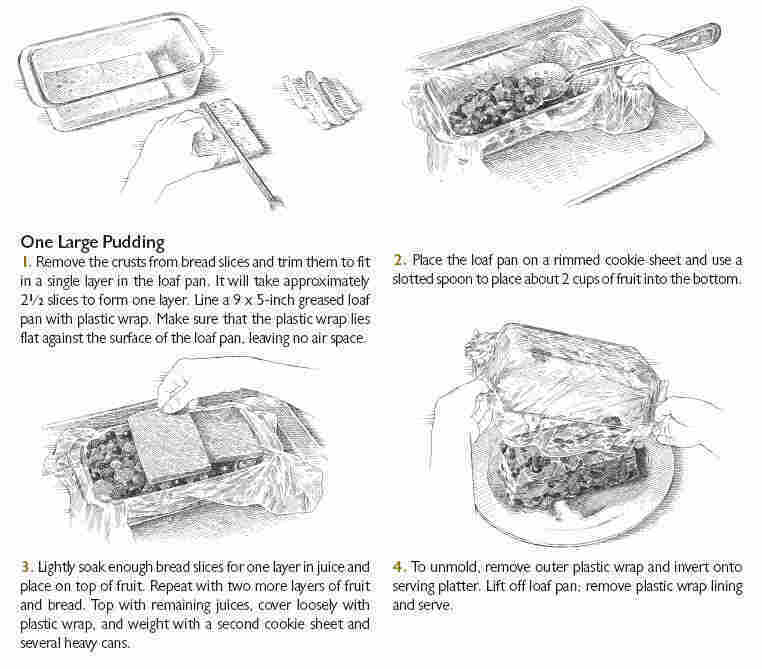 To ensure that this larger pudding unmolds in one piece, use a greased loaf pan lined with plastic wrap. Because there is no need to cut out rounds for this version, you will need only 8 bread slices, depending upon their size. 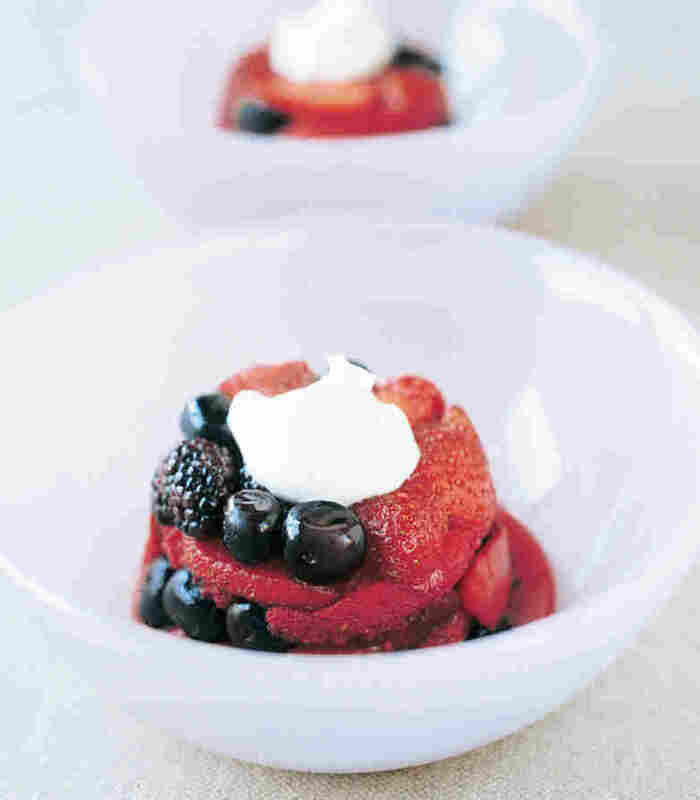 Follow recipe for Individual Summer Berry Puddings through step 1. While berries are cooling, follow illustration 1 [below] to trim bread, spray loaf pan with vegetable cooking spray, and line pan with plastic wrap. Place loaf pan on rimmed cookie sheet. Following illustrations 2 and 3, assemble, cover and weight summer pudding. Following illustration 4, unmold and serve.